Miralax is a very good stool softener for children ages 6 months and up. It works by bringing more water into the colon, softening the stool and making it easier to pass. It is very safe and is not habit forming. Sometimes families say Miralax “doesn’t work.” This is usually because the child wasn’t on the right dose or didn’t take it for long enough. Sometimes it takes several days to figure out the right dose of Miralax for any given child. The good news is it’s nearly impossible to overdose on Miralax, and it’s usually possible to adjust a child’s dose at home. If your child’s most recent bowel movement is still type 1, 2, or 3, double the daily dose. 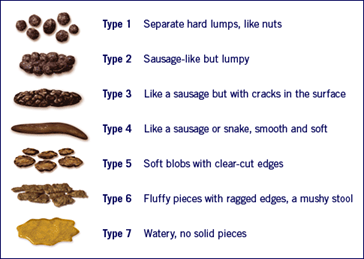 If your child’s most recent bowel movement is entirely liquid (type 7), cut the daily dose in half. If your child’s most recent bowel movements is soft (type 4, 5, or 6), continue the same daily dose. If you have adjusted the dose on the third day, wait three more days to see the effect of the new dose.